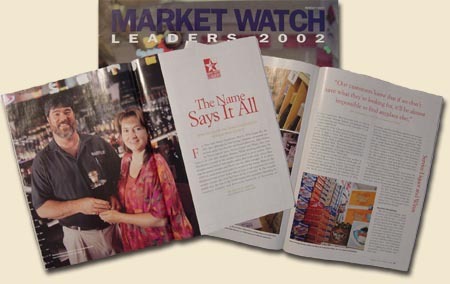 Market Watch, a leading national retail beverage trade publication, names a small handful of businesspeople as Market Watch Leaders each year. In 2002, the Hendersons were honored to be chosen for this elite group. "What makes a Market Watch Leader? Could it be a dedication to serving customers with the utmost care and personal attention? Or providing the largest selection of alcoholic beverages or offering the most competitive prices in one's region? The truth is that being a Market Watch Leader encompasses all of the above - and more." Market Watch goes on to describe Leaders as "role models not only to retailers in their home states, but to alcoholic-beverage merchants across the country." During the program's 20 year history, only one other Arkansas retailer has received the award. Writer Alicia H. Smith interviewed the Hendersons while photographer Wesley Hitt captured images of the store and its staff. The result was a 6-page article in the special Leaders issue which details Service Liquor and Wines' history and its recipe for success. "It was quite an honor to be counted with some of the most prestigious and successful retailers in the country," says Sherry. "We were treated to a special awards banquet in New York City where we rubbed elbows with the most influential people in the liquor industry." But not one to rest on his laurels, Dave says, "Tomorrow we're going to wait on our customers just like we do today." © Service Liquor & Wines who remind you to drink responsibly, and that alcohol products are only for those 21 years and older. Site by scottslash.